The RegTech Live! Artificial Intelligence event provides a platform for award-winning RegTech solution providers to share information on their innovative solutions that incorporate artificial intelligence in solving specific regulatory pain points to interested stakeholders, including our regulators, as well as senior members of Risk, Compliance, Operations and Technology Innovation departments. Our Regtech Live! format is uniquely enjoyable and educational, as can be seen from the video coverage from our inaugural event here. Audience attendees will have the first-hand opportunity to discover the innovative AI solutions from four regtech startups Gekko Lab, Miotech, Synpulse and Tookitaki which have separately been recognized by eg, MEDICI Top 7 AI Startups in APAC award; MAS Tech Awards; DIT (HK) Fintech Silver Award 2018; Fintech Bridge – Best Chinese Fintech 2018; Asia Private Banker Technology Awards 2016/2017; 2018 KPMG China Leading Fintech 50. 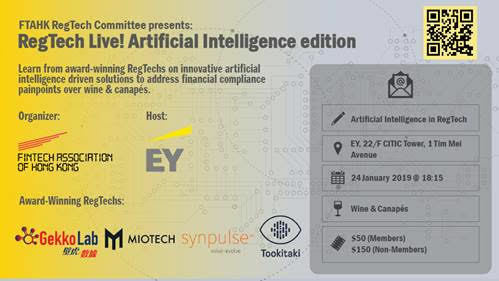 Following the presentations, audience members will enjoy a selection of wine and canapés provided by EY and will have an opportunity to continue discussions with solution providers.